March 16, 2019 - Dubai, U.A.E. 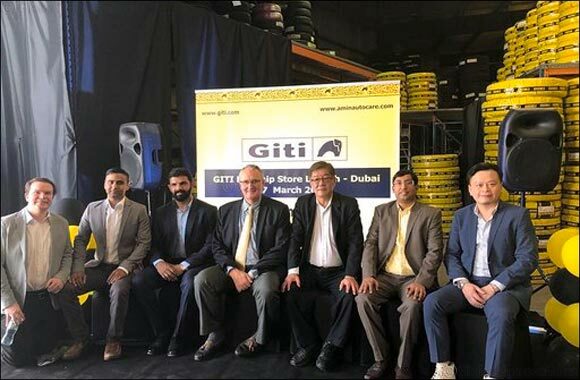 – With top executives from Singapore-based Giti Tire gathered in Dubai, the company inaugurated its first Giti flagship store on 7th March, 2019. In partnership with Amin Auto Care, the festive event included exciting displays, a ceremonial signing of a Commitment to Service, as well as remarks by Executive Director of International Sales and Marketing, Chris Bloor, as well as others. The event was held at the fast-growing Dubai Investment Park (DIP) district, a prefect location to reach a large and diverse customer base. The day began with guests invited to enjoy refreshments and view the inside and outside of the large and decorated mega store, complete with new signage and painting, revamped interior, and newly installed waiting room. A ribbon was cut to kick off the main event, where speakers from both Giti Tire and Amin Auto Care shared their comments and vision for the future. Finally, attendees had the chance to meet with company management and were given exclusive branded gifts. It was emphasized the importance of choosing the location as the Middle East’s first Giti Flagship store. Giti’s retail store program carefully selects only the stores with best service, customer experience, and branding potential. Giti Tire’s dedication to retail service was clear at the event, which was highlighted by an unveiling and signing of a ‘Commitment to Service’ display, signed both by Mr. Bloor and Mr. Chandran of Amin Auto Care. Prior to the signing, Elson Tsai, Head of International Marketing for Giti Tire, shared the importance of the commitment. “The signing of this today is more than just a paper, but a shared agreement for Giti and Amin Auto Care to provide the best levels of service the entire local community. Through this commitment, we will be able to achieve success and grow further together”. Each Giti Flagship store must adhere to the principles of the company and brand in order to be selected. Based in Singapore and one of the world’s largest tire companies with USD $3.4 Billion (Dh 12.47 Billion) revenue in 2017, Giti Tire has had a strong presence in the Middle East for more than 25 years, selling different brands in the region. However, the recent introduction of its flagship Giti brand and its new product and communication offerings has put the company more in the spotlight. With a full range of passenger car, SUV/4x4, and commercial truck and bus tires produced in eight factories in China, Indonesia, and the US, as well as expanded brand presence, Giti Tire is strongly poised to continue growing its brand presence in the Middle East, where it has dedicated distribution partners in all major markets in the region. Adding into its 35,000 global employees and 12 offices around the world, Giti Tire recently established a local Middle East office located in the Dubai Free Zone.